An envelope arrived in my mailbox yesterday…and it sparked today’s Perfect Picture Book Friday story…and the craft activity that follows. My 4-year old grandson sent me a TREASURE MAP! How exciting! So I knew that today’s Perfect Picture Book Friday choice would have to be about…PIRATES! “Best-selling author Cornelia Funke and acclaimed illustrator Kerstin Meyer — the winning team behind THE PRINCESS KNIGHT — deliver another glorious adventure tale that celebrates girlhood! Pirates and girl power…all rolled up in a fun adventure. The illustrations are bold and captivating…and the story will appeal to any kid who loves a pirate story. To let girls know that they, too, can be ‘pirates’. But for Busy Mom’s on the Run…here’s an alternative. You will need: 1 piece of white construction paper (or copy paper), scissors, markers or crayons. Cut uneven scallops along the edges of the paper. Use a brown crayon or marker to add color to the edges so that it looks ‘antique’. Draw your map…making sure to have an ‘X’ to mark the spot of the treasure. Talk with your kids about maps. What did people do before there were any maps? Find pictures of old maps. Look at maps of the United States at different times in our history. Take a walk with your children and make a map of your street or neighborhood. I wanted to share some good news! I’ve been asked to ship several boxes of Show Me How! Build Your Child’s Self-Esteem Through Reading, Crafting and Cooking to Singapore for the bookstore at the Asian Festival of Children’s Content. My Parents Forum presentation is: A PICTURE BOOK IS WORTH A THOUSAND WORDS…USING PICTURE BOOKS AS PARENTING TOOLS TO BUILD SELF-ESTEEM AND STRENGTHEN THE PARENT-CHILD CONNECTION. To celebrate, I am having a FREE SHIPPING promotion! Do you want to encourage your child’s creativity? Show Me How gives you 100 picture book suggestions and a simple arts and crafts activity for each one! Get FREE SHIPPING (to any US address) if you order a copy from my author website in the month of April. 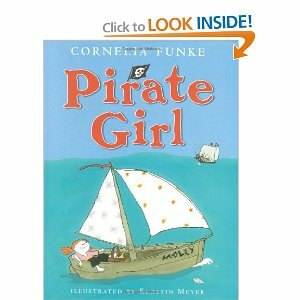 This entry was posted in Perfect Picture Book Friday and tagged Asian Festival of Children's Content, Cornelia Funke, Perfect Picture Book Friday, Pirate Girl, Show Me How! Build Your Child's Self-Esteem Through Reading, Treasure map, Vivian Kirkfield by viviankirkfield. Bookmark the permalink. 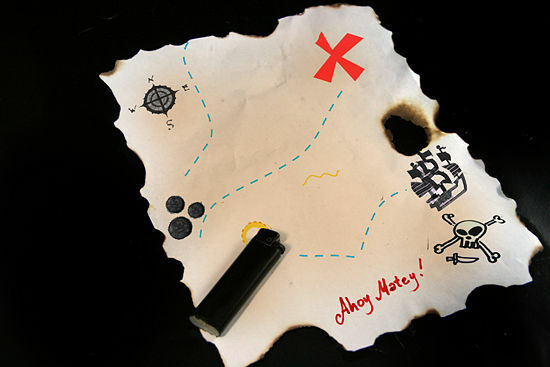 Awww… you got a treasure map, how cool! Loved the choice of book today Vivian, Molly certainly sounds like girl-power which I would love to read. Look like very cute, colourful illustrations to. Thanks Vivian. Have always loved Cornelia Funke, from the days of reading aloud to the family her Inkheart series. This is wonderful… parents and teachers would certainly benefit from your Perfect Picture Book Friday. Nicely done! Thank you so much, Carmela…I appreciate your kind words…and value your input. 🙂 One of the best things about Susanna’s Perfect Picture Book Friday is that wonderful books are revealed that we might have missed! I love strong girl/women books! This sounds like a fun read. You didn’t post your post on Susanna;s blog, but I caught it in my WP reader. Love the treasure map. How much fun. Congratulations in advance! Yup! It’s pretty exciting. 🙂 Thanks, Pat! Love the treasure map! And I love the name Horrible Haddock! That map that your grandson sent is awesome! He is a treasure! And this book looks spectacular. I love books with unconventional girls. I’ll have to check this one out. Thanks for sharing! Children are treasures…I agree. 🙂 (and so are pets :)Kids love surprises and mysteries…treasure maps are a fun activity for them. 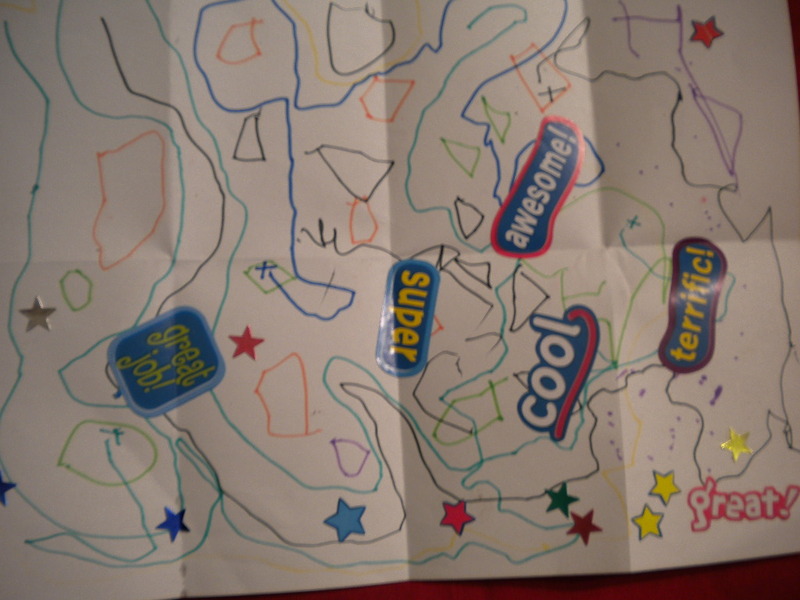 My kids love to make treasure maps too, but they’ve never shared them with me! My 5-year old loves maps and he has to have the one to any place we visit. He’s really good at identifying where we’re at on the map and how to get somewhere. I’m sure he won’t ask for directions when he’s a grown man, but I have no doubt he’ll be very good at navigating! I love your grandson’s treasure map. There aren’t many pirate books that I haven’t loved. This one is definitely in the loved pile. I love maps as well…especially old antique maps. It’s fascinating to see what mapmakers thought the world looked like before they had people traveling around to actually describe what they had seen. What a colorful, wonderful map, Vivian. Several years ago, I wrote a story for HIGHLIGHTS about “Benjamin and the Paper Trail.” During the Depression, a boy and his grandmother put the money they earned into jars and buried them in the yard and garden. They made maps leading them to the jars. When I read Grace and Gannon the story, they each got a jar and emptied their piggy banks into them and then chose places in the back yard to bury the jars. Their maps were delightful, identifying bushes and birdbaths and sidewalks as markers. Treasure maps are terrific fun! That is a wonderful story, Marylin…I so appreciate you sharing this with us. 🙂 And congratulations on the ‘Highlights’ story! I submitted something to them recently for a contest they were holding…we’ll have to wait and see what happens. Here’s to finding TREASURES wherever we roam. Now, I really like this book. Who wouldn’t want to read about a feisty pirate girl? Glad you have a little pirate grandson also. 🙂 Thanks for stopping by, Tracy!